Usually they are very expensive, but recently a company named FormLabs has shaken the SLA world up a bit and offers a nice machine for a lot cheaper then most. It is still a $3,500 machine mind you, but high end laser printers can cost that much to be fair so it’s somewhat affordable. We pre-ordered there most recent Form 2 printer, which offers a number of improvements, and just got it set up and printing. So far I am very impressed. The build quality is very nice. They also did a good job with the interface, software and directions. We had it printing in no time. 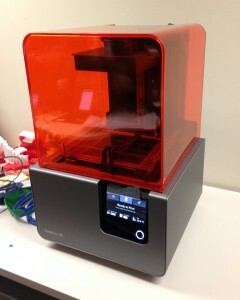 While it was not as much fun to watch as the Delta printer we have, it does look professional. Close up of resin tray. We have only printed a few things, but the quality is amazing. I will be sharing some prints very soon. 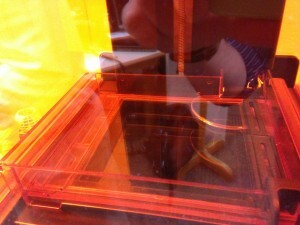 This entry was posted in 3-d printing and tagged 3d printer, form 2, formlabs. Bookmark the permalink.